Event Planner is an event tracker that you can use to keep track of all your major events and any smaller events that you might have to complete first. 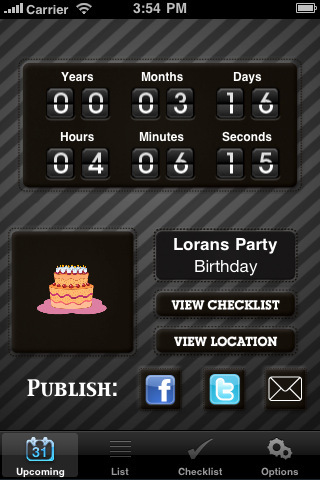 Need to remind yourself of a party? What about the drinks, dishes, food, and other things you have to buy? What about picking up your parents from the airport? So much to remember on your own… so what if Event Planner could help? 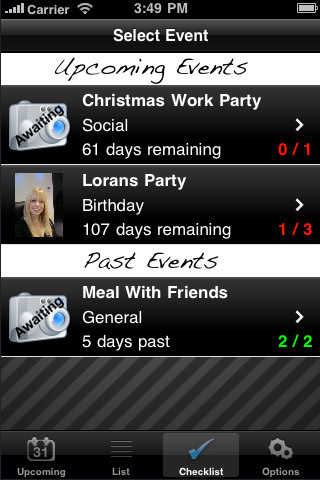 Event Planner, developed by Dan Hillman, is available for the iPhone, iPod touch, and iPad for $0.99. Make sure you are updated to the latest software version of your iDevice before purchasing this app. People have experienced crashing and load issues. Check https://sites.google.com/site/element24iphonedev/bugs to see the troubleshooting guide to make sure that Event Planner doesn’t crash. Rough start to a review eh? So yes, Event Planner has crashed on my while I was using it before. It happens at startup randomly, and it happens while I’m making a new event sometimes. However, I did just update to iPhone software version 4.2 and the crashing has minimalized. Adding a new event is simple. You enter the title, what category the event should be classed as, give it a date, time, and you can even assign a picture to it. From there, you can then add check-off lists to each event. Like my example in the introduction, you can set up an event like your girlfriend/boyfriend’s birthday. Inside of that, make a checklist of to-dos that you must complete before the event like present purchases and wrapping, friend invites, food preparation, and other things. You check on these lists and it’s just one touch to check off a task. The functions of Event Planner easily make the default Calendar app in your iDevice obsolete except to just check what date it was… or at least, that would be what I would have said if it weren’t for the crashing issues. Sometimes, if you fill out all the info for your event and then try to add a picture, taking a picture can actually crash your app and cause you to lose all the information you set up. It’s annoying, but with a few patches, I’m sure the crashes can be fixed. I honestly liked this app, but as it is now, it’s still a bit of a risky investment. Let’s see where this app goes with some time. AppSafari review of Event Planner, Checklist & Countdown was written by Joseph Ho on November 26th, 2010 and categorized under App Store, Events, Utilities. Page viewed 5649 times, 3 so far today. Need help on using these apps? Please read the Help Page. Thanks for the review! I’m the developer of this app, and just thought i’d mention i’ve added plenty more functionality, and fixed a load of bugs. The app runs a lot better now.